CASHE is a local Chapter Affiliate of ASHE. Our society is composed of Healthcare members in the leadership roles of engineering, maintenance, safety and management. In addition, our associate members represent the sales and service organizations that support Healthcare Institutions. Founded in January of 1964, our society was developed to generate relationships through the avenue of education and friendship. Membership in the society brings about closer cooperation among members in order to promote efficiency, to provide a medium for the exchange of ideas and to disseminate material relative to healthcare engineering. 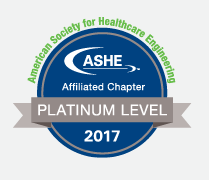 CASHE, in collaboration with the American Society of Healthcare Engineering, is dedicated to optimizing and promoting efficiency in the field of healthcare facilities management by sharing experiences, training and resources.